Right about now, you might be finding your garden overrun with zucchini. Or maybe you have a neighbor forcing pounds of the baseball bat-sized green squashes on you. Either way, you need to make some zucchini bread. I originally got this recipe from one of my favorite farmer’s markets. They had samples. I tried one and said “Oh, yum! I’m going to need the recipe.” When I got home I read the recipe and nearly fell out of my chair. 3 cups of sugar. 1 cup of oil. No wonder it tasted so good! Call me crazy, but I feel like bread made with vegetables should at least try to exercise some restraint*. So this is my altered version. It uses half the sugar and replaces half the oil with non-fat Greek yogurt, and it still tastes delicious. The texture is somewhere between cake and a muffin. 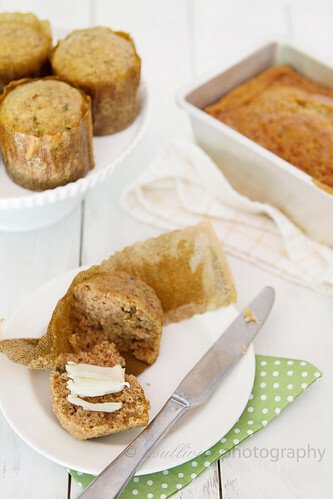 They’re moist and lightly sweet with lots of cinnamon spice flavor – just the way I like my zucchini bread. I highly recommend adding chocolate chips (which I forgot – first time in my life I have ever forgotten chocolate!) and/or nuts, if you like that sort of thing. This recipe makes enough to share – 2 loaves or a loaf and muffins – so feel free to pay that neighbor back for sharing their garden goods! * For those of you rolling your eyes at the thought of using restraint in baked goods, stay tuned. The next recipe uses over a pound of butter and more than 4 cups of sugar. And heavy cream. Preheat oven to 350° Prepare baking pans – line muffin tin with liners and/or spray loaf pans with non-stick baking spray. In a large bowl, whisk together dry ingredients (flour through cinnamon). In a medium bowl, beat eggs lightly. Add oil, yogurt, vanilla extract, lemon juice, and water. Whisk. Stir in grated zucchini. Pour wet ingredients into dry and whisk just until combined. Divide batter evenly among prepared pans. Bake standard loaves about 45-50 minutes and mini loaves and muffins about 20-25 minutes, or until toothpick comes out clean. Cool on a wire wrack. Store covered at room temperature, or wrap tightly and freeze for later. I love the idea of the yogurt in there! I will definitely give this a try. I assumed I was going to be getting tons of zucchini from my CSA this summer, but we really only got a few weeks of it. I’m definitely bookmarking this for the next time I have some, though! I tried a zucchini bread recipe earlier this summer and was not a fan because it was a bit too savory for my tastes, even with half the sugar this sounds like something I’d like a lot more.